Sri Lanka’s former defence chief, accused of overseeing the massacre of thousands of Tamils, announced he had taken steps to renounce his American citizenship as he arrived back in Colombo on Friday. 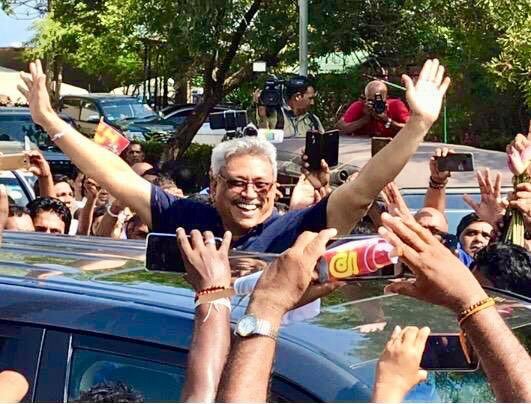 Gotabaya Rajapaksa was greeted at Colombo’s airport by hundreds of supporters, who garlanded him on arrival. He had just returned from the United States, where he had been served notice of two civil lawsuits filed against him. Rumours had been swirling regarding Rajapaksa’s dual citizenship, which reportedly posed an obstacle to him holding office in Sri Lanka. The renunciation of US citizenship may now clear the way for him to run as a candidate in this year’s Sri Lankan presidential elections. Speaking on the lawsuits he currently faces, over the torture of a Tamil survivor and the murder of a prominent Colombo-based journalist, Rajapaksa told his supporters that the litigation was politically motivated. See more from Reuters here. Gotabhaya was Sri Lanka’s defence secretary during the final phase of the armed conflict where Sri Lankan troops systematically shelled hospitals, no fire zones and committed widespread sexual violence. In the past he has defended the military’s bombing of hospitals, and even stands accused of giving direct orders to execute surrendering Tamils.